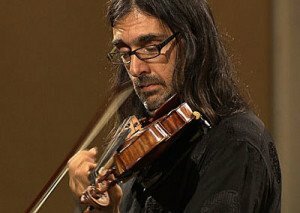 Leonidas Kavakos is one of the world’s musical originals. Violinist, conductor and aesthetic high priest, he spoke to BMInt briefly about his concerts with the BSO this week, his Celebrity Series engagement in February, and his Tanglewood visit next summer, while also imparting more than 5,000 words on larger themes. You play the famous “Abergavenny” Stradivarius violin of 1724, yet you own a lot of modern violins too, and bows both ancient and modern. How many violins do you need, and how many do you actually play in concert? Leonidas Kavakos: In concert I mainly play the Stradivarius: that is clear. Every now and then I might play one of the new violins, but as a norm it’s the Stradivarius. For me, violinmaking is a fascinating art, because first of all you start from a piece of wood – you practically start with the branch of a tree. When you actually go to a violinmaker’s shop and you see the pieces of wood, they just lie there, unworked…. They look good, you can see it’s going to be a nice piece for the back of an instrument, etc. – but it’s just a flat piece of wood. When you actually see that, you understand. Even a part of a branch that’s been brought into the shop, in the end, comes out an instrument that not only looks so beautiful but also has a sound. For me, that is fascinating. With the other forms of art like painting or sculpture: sculpture I find amazing because you have a piece of marble which all of a sudden you give a great shape. FLE: Or, if you’re Michelangelo, you find the shape that’s already in it. That’s even better than what I said. The thing is, once you have finished, it’s a fantastic product that is going to influence and guide aesthetically many people – but it doesn’t have a function. The instrument has a function. The instrument you can enjoy as a fantastic work of art in a museum, but you can enjoy it even more in a concert hall. But why do you want to own new ones? I can understand that you can love the process. First of all, this is an art that I want to support. Also, the violin is an object, a musical instrument that needs time to grow. We have letters of prominent violinists of the time when Stradivarius was alive, because he was the only famous maker of his time, meaning the only one who actually could make a really good living just by making violins. So we have letters from prominent violinists who say that they’d rather play on an Amati instrument, for instance, because the sound of the Stradivarius was very good but a little raw. And at that time, the Amatis were 100 years old? Almost 100 years old, and the voice of the Amati was much more mature, and so on. So you can imagine that this means that what we today consider unsurpassable was, at the time, not. This means that today, what we have as new instruments might be in two centuries the great instruments that the new generations are going to be playing on. So even when you make a new violin with old wood, it’s not going to be the same thing. It still needs time to develop after it becomes a violin. Yes, because the wood needs to vibrate; it has to be played, so that the wood vibrates together. So that the overtones are helping each other, in order to create not just the sound, but also what one admires in old instruments: the colors, for instance. You’re playing these new violins so that someday someone will thank you for imparting a good sound to them. You’re going to imprint your sound. Well, yeah, but also I think that this is an art that besides being very special and unique is an art where the form has not been surpassed. The contemporary makers practically copy the form of the old makers. It’s not like, for instance, when you look at the piano and where it was in the 17th century and where it is today. It doesn’t evolve anymore, but it evolved a lot in the 19th century. It did, but I don’t know if it’s going to evolve anymore. I’m trying to say that still, today, the greatest piano built today is practically dead in 50 years. Although there are people who love old, ancient pianos. But the piano’s crown becomes slack in 50 years, so it loses its tone. Of course, it might have a wonderful quality, but we won’t be able to use it in the concert hall. It doesn’t improve with age like the violin. What about the players? Have they improved? That’s a very interesting question. I think the players have improved in certain ways, but with the newer generations, I’m afraid, we are facing the danger of forgetting [about] what we are doing. Unfortunately I see more and more young people starting to play music in order to make a career. I was someone who never had the training—not from my parents, not from my teacher, and not even from my managers at the beginning of my first steps. And having had this luxury [of not being “career”-trained], I can assure you that the greatest thing about being in the world of arts is that you can, every day, be looking at the great score. Looking at the great monument, at the great achievement of humankind, and be able to actually translate the energies this creation projects. But it’s not even that, it’s worse. What I’m trying to say is that the young people who start playing nowadays are focused on having a career as big as possible and as early as possible. That means that they’re focusing on their own world. This is really wrong – because what endures is not what we do. What endures are the scores. Do you think you had the leisure to develop at a quieter, slower pace, so that you could become a complete person? No one was rushing you? Yes. It was a combination of wonderful coincidences that guided me in such a way that I was not forced to explore all of my possibilities at a very early stage. So I had the possibility to grow up also as a normal person, a normal child, who likes to do [things and] naturally does not like to practice, let’s put it that way. First of all, if someone wants to practice … I already feel that that’s not so natural as a kid. As a kid, you need to really learn the environment. You want children … you know, you give them the smallest little object and they can spend hours on it. Imagine the reflexes when they are around people and they’re around new objects all the time. So if you want to explore that…. So I think these are problems, and I am so thankful to my parents and my teachers and everyone who really did not push me through that. It all came in a way that was the most natural for me. Not in the sense that I was expecting it – and that’s really fantastic, when something fantastic comes and you’re not expecting it. Then you really realize that you have the chance to love life even more for its generosity sometimes, rather than if you think that you deserve that. Many people think this way: “I deserve this. Why is this not happening?” and you get very desperate about it. And even when you start getting things, you’re never ready to enjoy them – and to appreciate them, which is even better than enjoying them. And the arts, as we all know, the great creations are distilled human experiences, and one cannot (thank God! ), until today, one cannot beat time. Time is crucial, and the time is not crucial in terms of being there before somebody else, but time is crucial for each and every person, in a different way (and at their own pace) to try to accumulate as much human experience as possible. Then that can all be contributed to whatever art one is going to want to do. Or you’re not going to be able to put into the work those experiences that the interpreter will draw out. Of course! Even worse for the composers than for us. Because we play something that already someone else has created. We aren’t creating, we are re-creating. I don’t know how to express it in words, but the great piece of music in the score is there before me and will be there after me. That is the actual creation. Do you have the feeling when you’re standing in front of an orchestra, either as soloist or as conductor, that everybody on the stage feels the same way? No, that’s why I always try explain. Maybe not in a direct way, depending on how the rehearsal goes, but I try always to make sure that I say this somewhere at the rehearsal—just to make people aware of it. When one gets into this kind of circle and then it becomes a profession, the dangers are even greater. You think, “I’m a good professional,” but it’s not about a profession here. But you want your colleagues to like you, in addition, or not to fear you. It’s not about fearing somebody or liking somebody…. Who is going to like me less or more if I say that this score that we’re playing was here before us and will be here after us? I think the privilege we have, the blessing, is that we are dealing with these masterpieces – these monuments. First of all, in order to stand in front of that, you need to be very strong. I think he’s the least kitschy kind of composer I’ve heard. As a violinist, I can say that I feel, having played quite a lot of the music written for the violin, that at the moment, it is time for me to focus on fewer works, because I feel that our time calls for that sort of supernatural power that music has to keep a certain memory of the human values, which are starting to be lost. I had an interesting discussion about a year ago during my residence at Santa Cecilia Conservatory in Rome, and as part of that there were concerts and concerts and concerts, and then there was a discussion with the audience. Somebody asked me whether instead of bringing the people into the concert hall we should actually bring the music to the people here and there, export music from the concert hall. I’m totally against that, because for me the concert hall today is one of the last places where people of all nationalities, all religions, all beliefs, all tastes, all generations, whatever, can gather in communion. So it is a sacred temple. It’s one of the very few. We can find churches, but you can say that that’s just because of religion: a Christian doesn’t go to a mosque, a Muslim doesn’t go to a church, a Christian doesn’t go to the synagogue, a Jew doesn’t go to a cathedral. It’s like everybody has their own place. But for music, the concert hall is the last place where people come, from every clan and religion; they gather together, and for one-and-a-half hours or two hours in silence, they experience a communion. It’s really something that for me is like one of the last precious things that we have in our time. I’m not saying that one shouldn’t try and reach out for new audiences and so on, but the problem is to give them the possibility not just to hear music, but also to experience this kind of communion. So one has to present it in a different way; it’s not just about music. Do you think because young people aren’t exposed to music in schools like they used to be, that they’re still capable of feeling this sense of the sacred about music? I think it’s not about the music, it’s about the sacred way of gathering in a concert hall. Each one of the thousands of people should feel the sacred, but I’m sure that if each one could describe in words what they heard, you would have thousands of different understandings of the sacred. Everyone wants to feel rapture, to feel transcendence. Yes, clearly, but this can happen only in a concert hall. It can’t happen in front of a record player? It can only happen when you’re with a group of people intending to do the same thing? So it’s better when you reach out to reach out and bring people into these places. I really believe so, and I believe also that it’s important, so that in my own festival, in Greece, I picked a program where every piece ended in silence. So no big, glorious endings, but small ones. Before the concert, I said “Short, nothing long,” but I just told them that we never expect that actually, when we go to a concert hall. What we’re going to hear started from a blank piece of paper, like with a painting. A blank piece of paper, then all of a sudden, we get the greatest thing. What we actually hear always started as a blank piece of paper in total silence. So how would you feel at the end of the concert if people didn’t applaud, didn’t say a word, just walked out? That’s what I asked them to do. I said, “I picked this program with these works, and none of them will finish in a loud way … that’s the purpose of it. I wanted everybody to understand this, and I asked them kindly not to applaud. No. It was absolutely amazing. Everybody stood up, there was little light in the hall (because, of course, you couldn’t have them in the dark), just a little light to see. We stayed on stage – the stage was totally dark – and they went away slowly and silently. You can’t imagine what they told me after the end of the concert, that they’d never experienced anything like this. There were people who started writing in the concert, there were small children who started drawing things. People came and told me that they’d never experienced something like this. What would Tony Fogg, artistic administrator of the Boston Symphony Orchestra, say if you proposed a concert like that at the BSO? [Thoughtfully] I don’t know. I don’t know, but I’m happy that I could do it once, and you know, the last piece on that concert was a Schulhoff string sextet. I don’t know if you know it, but it’s a fantastic piece. It’s a great piece also in the way that it builds that kind of silence, because it’s a process; it doesn’t just happen. But a Schulhoff piece not an obvious one for anybody who comes into a concert hall. I still remember these people coming up to me in tears. It’s a release of energy. You don’t release that energy, you keep it inside when you don’t applaud. That’s the actual effect of music. But aren’t there are other times when you want to feel like a virtuoso and whip up a frenzy? I don’t feel younger if people applaud very loudly, let’s put it that way. If they don’t applaud, then you’re not going do the Erlkönig transcription as an encore in your next solo recital? That’s actually a great piece. It’s actually a fantastic transcription, with a few exceptions. Yes, of course, that’s it, but also recently I conducted Death and Transfiguration of Richard Strauss for the first time. It also, in a very different way, starts from silence, and it ends in silence. It’s amazing, because of course in philosophy, every birth is a death on another level, in another way. For somebody to incarnate, you leave one place to come to another place; for that question of life … one is together with the other. In the music, when you have this kind of silence, you are so close to that. You can get so close to that kind of calmness and– I don’t know how to word it properly in English, but for me, this is really the quintessence of being part of a concert, as an audience [member]. Therefore, the whole concept of being in the music, allow me, business becomes totally different when you look at it in a sort of way like this. This is unfortunately not taught. Are we going to experience these profound feelings in the three pieces that you have planned for this series of concerts? The Prokofiev is not the deepest of works. No, and the idea behind the program I chose was that in the first half we have this kind of very upbeat music that is very entertaining, starting with Mozart’s Violin Concerto no. 4 in D major. For me the first half, including the Prokofiev Classical Symphony, has a long D major presence or identity. The D major in both pieces is a very happy D major, a sparkling D major, but there’s a very different kind of humor in D major in these two pieces. The contrast between these two senses of humor is for me what is the focus for the first part: I’m interested in a psychological or emotional effect to the audience. Both works are both very fresh. Prokofiev, we know, had this amazing ability. Mozart, of course, was Mozart, but Prokofiev … looking back, being neoclassical … I think he couldn’t come closer to what the old guys did. What was Prokofiev trying to prove when he wrote that symphony? I don’t know whether he was trying to prove something in that symphony. Think about Picasso, for instance. You think he always did this modern stuff, then all of a sudden you go to the Barcelona museum and see his early sketches, which are absolutely mindblowing. The man had the perfect hand. That means the man we associate with Picasso was someone who was his personal choice, and not the result of weakness. And I think that’s maybe the same thing with Prokofiev: “Look, I could very easily write like this,” he might say, but the next symphony, the Second Symphony of Prokofiev, is absolutely wild. I can’t tell you for sure that this is what it is, but when you look at the Second Symphony, it’s so complex and it’s so difficult to listen to … enormously difficult to play. Such a contrast could not be bigger, just between these two works. The Fifth Symphony and the others are easygoing compared with the Second. So this means, “Here is a look at what I studied, or what I learned, but I can still twist the material; but then I will go on to show you what I can do.” I think that is very wonderful. I also like to combine Mozart and Prokofiev for some reason, since Prokofiev never had this kind of gravity that, for example, Shostakovich had. Not in terms of quality of composing, but in terms of emotion. And there’s more transparency than Rachmaninoff, certainly. So you have a transparent first half, and then how do you make the orchestration of Schumann’s Second Symphony sound less thick to fit in with the scheme? The orchestration of Schumann does not sound thick, if one follows what’s written in the score. When you look at the score, the melodies are very obvious, the material is very well-organized and structured, but what happens is that the dynamic expression instructions (all the accents, for instance), make sure that there’s always something happening that disturbs the music. Schumann’s instructions are often rounded for the sake of … I don’t know what. So I read to the orchestra the introductions from my score. I told the players how it says in his biography that the first three movements should project discomfort. So I said, “Look, please, let’s try and do what is written. If you see a sudden accent that is written without preparation, don’t prepare it.” The moment you’re preparing an accent, you miss something else. The moment you arrive at an accent, we’ve already compromised it. We actually take away from the meaning it has. It’s not easy, always, to convince people about this, but for me it is very important, and I feel that if this is there, the score is very transparent. It’s not thick. It has to project this idea; we should not make it sound beautiful when he actually intended to have this kind of difficulty through the music. So it’s a mistake to have too wet a string sound. You mean in this piece particularly. Yes, I’m talking about this piece. When the composer’s message is, “Project discomfort,” I cannot make it nice for the audience. You think this will be quite different-sounding? You’ll have to tell me after you hear it. I cannot tell you. You think the orchestra’s with you on this approach? They’re a fantastic orchestra and they’re trying to do what I’m asking them. Sometimes it’s not easy to forget habits that are there, but at the same time it’s very refreshing. Sometimes, we try something and I can see the musicians start smiling because they can hear what the point is. What are you going to bring us the next time you come? I’m coming here in February for a recital for a Celebrity Series recital at Jordan Hall with three Beethoven sonatas, including the Kreutzer, then I’m coming again in the summer for Tanglewood—that’s going to be a dream come true, when I’m going to be performing with Yo-Yo Ma. We’ll play some string music together, and then, of course, I’ll play with the symphony orchestra—the Szymanowski Second Concerto. It’s an absolutely incredible score. An incredible score, with millions of layers, millions of colors and an incredible fantasy. We’ve been waiting for a long time to hear Marc-André Hamelin do the Szymanowski symphony with the big piano part? He’s a great composer, oh my God. Very underrated, but I think he’s coming up more and more. I have some technical questions from a violin maven friend. First he asks about your unusual technique in how you hold the bow. But my bow hold is not my own invention [demonstrates]. That bow hold actually comes from the old Russian school, like Mischa Elman. Even Heifetz used to hold the bow this way [demonstrates]—even more extreme than I do. What does that let you do? My concept about this school of bow hold is that if you put the hand close to the body, as it would be in a tuning position—open strings, whatever—that’s what happens. This is a normal position, so I put the hand there and I’m in a normal, natural position. So it feels better. 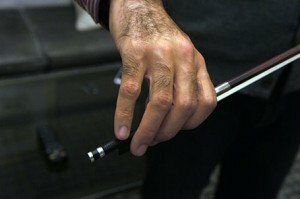 So you have almost a right angle between the hand and the wrist with the conventional grip, but with the Russian bow hold, your arm’s straighter. Your wrist’s straighter. Right. When I go to the tip, I’m there. I have less stress. The homogeneity of the sound is there from the frog to the tip: it doesn’t change. The angle of the wrist remains the same whether I’m at the frog or at the tip of the bow. So there’s less interruption between the elbow and the shoulder and the finger, where you actually hold the bow. I feel this creates a more natural position for the bow, and the sound production is also more homogenous. It is more difficult, technically, with the conventional hold, because you need to work more with the fingers, whereas here not so much. And how tight do you keep the violin under your chin? Sometimes tight, sometimes not so tight. I was having a discussion with another violinist about vibrato, and he said that when he looked at paintings of old violinists, it wasn’t tight under the chin, and so they couldn’t do as much vibrato. That’s why the style of continuous vibrato came about only when the chin became a vise. Fritz Kreisler was the first to introduce this very intensive vibrato. I don’t know whether this was the case then with chinrests or not, but I believe that Nathan Milstein was someone who had a very tight vibrato, and he never held the violin under the chin. It was all done by the hand. … I wish I could do the same thing, but I can’t. This is such an unnatural position for the body, the violin, the way we hold it, it’s just a disaster. From whichever way you look at it, it’s a disaster, so the less pressure or the less tension one has, the better it is. And with Milstein, it’s is not by accident that he could play so well until the age of 82. He was so relaxed when he played, and he never held the violin under the chin. He just put it here, but he never really held it like I do. Maybe he didn’t have such a high neck (and this is the other problem, you know, if your neck is long, then if you have no shoulder rest and you try to bring your violin here, you need to bring your shoulder up … and in the long run, after many years, it’s not straight. So there’re many, many ways. There’s no real recipe for how to hold the violin and how to hold the bow. The best thing is for each and every person to find their own way. However, having said that, I believe that the bow hold the way I do it is more natural in terms of distribution of weight, balance, and also in terms of production from a homogenous sound from frog to tip—which many times is a problem, because on the tip the sound becomes a lot thinner. Do you ever wish that you could get more portamento from a section? When you play Schumann, should there be juicy slides? Does that tie into your desire for accents, or do you find it repulsive? First of all, I think that the portamento is a very personal technical detail of expression. Very personal. It’s like we cannot have 10– let’s say we cannot have even two or three people that are going to make the portamento the same way, it’s not going to sound the same. Except when you listen to recordings from the 1920s and 30s, you hear this huge portamento from whole sections. And though many people hate it now, some people think it’s coming back…. The most expressive tool in string playing is not the left hand, it’s the right hand, and that’s what I’m always trying to indicate and say to people and so on. And I also ask this from the orchestras when I conduct, in order to achieve that kind of expression. 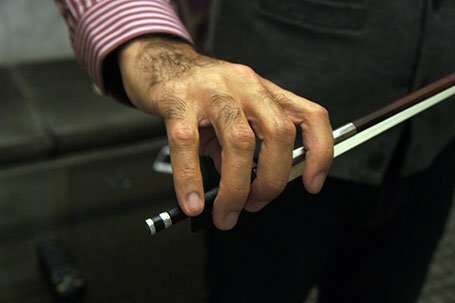 Because the moment you talk to a group about expression, you immediately see that vibrato starting…and it’s not there in the wrist, it’s here, on the right hand. So for me, the portamento, I probably would not [ask for it], especially in music like Schumann. So you as a conductor have never asked for sectional portamento? No, not yet, not yet. Look, if it comes at some point, I might do it – but it’s not something I’m going to look for, that I’m going to go after…for me portamento is a very personal thing, and if I have 16 people doing it…. No, I would not say it is embarrassing, but if I had an orchestra that I’ve worked with 10 years, maybe then it’s possible to ask them to do something like this, because then everybody really understands how it should be done. …You know each other much better, you know what everyone wants, and then you don’t do it in a way that would disturb. But if you start asking any orchestra that you go to, “Could you please make a portamento here, maybe a portamento there?” what’s going to happen is that the situation will get out of control. The personal element is probably going to win over the ensemble element that one has to have. Yes. And most probably what will happen is that what will come out as an acoustical result will not be tasteful. So you can conceive of this working if you had years to develop it. So that is a portamento, it is a slide. It’s a singing style, isn’t it? Yes, but, you know, a slide or portamento … maybe I understood it wrong, because for me, it was usually this kind of going up with a [sings]) ta—wee!—with this kind, I cannot take it, especially from a whole orchestra … but vocalizing … you see, I use a different term. Probably what you mean by portamento, I call vocalizing. When I said, “Please vocalize this,” the whole orchestra understood. See, it was funny because I didn’t ask them to make a portamento … I always try to avoid speaking in technical terms, because for me the essence is the expression. If the expression is right, then it doesn’t matter. My teacher told me, “I don’t care how you hold your violin! If I hear the right thing, I’m not going to say anything. That’s all I care about – to hear the right thing.” And it was very interesting. I mean, I only conducted them once, two or three years ago, so I don’t know … it’s not like an orchestra that I work regularly with, and they know me and I know – but the moment I said “vocalize it”, everybody understood. That makes me very happy, because it was really what I wanted to say. It wasn’t “Can we make a portamento?” That would be a very technical thing, but “vocalizing the interval”, that’s something different. Okay. Well, when I hear it, I will tell you whether I’d call it a portamento. What a fine job by Lee and Leonidas! Yes, a superb, thorough interview. The performance last night reminded me of the thrill of hearing Oistrakh back in the Dark Ages, when the music world was astonished at his ease at playing with such sweet, clear pitch and such emotive bowing… given to us last night in Kavakos. Now, reading this article after the fact, I understand more. What a player! And I loved the Prokofiev interpretation – with those wonderful suspenseful pauses. And all those subordinate melodies were noticed, without overplaying their parts. Was I hearing correctly that one horn slightly botched the opening of the Schumann? We heard Hamelin play the Szymanowski Symphony #4 in Berlin two years ago and would do anything to further any performance by him of anything by this composer here in Boston. Petition, anyone? And the horn entrance wasn’t quite right on Friday afternoon either!?! But otherwise the concert was a dream — the playing, the interpretation, the musicianship. And I don’t know whether it was the violinist or his violin, but the sound, pure and simple, was the most beautiful that I have heard from a soloist since I don’t know when. Pre-echoing Kavakos, Daniel Baranboim in his Norton Lectures some years ago reminded listeners that “Music must begin in silence and end in silence.” There is a subtle contradiction in Kavakos’s wishes to gather audiences to listen and also to have silence at the end. Crowds tend to be stampeded into ovations. I wonder how many of us have ever really heard the final chords of Carmen or Brahms 2 in a live performance.